Alabama fans in Tuscaloosa are celebrating the Crimson Tide’s 45-40 win over Clemson in the College Football Playoff National Championship. APR’s MacKenzie Bates takes us to campus where the partying held strong long after the final whistle. 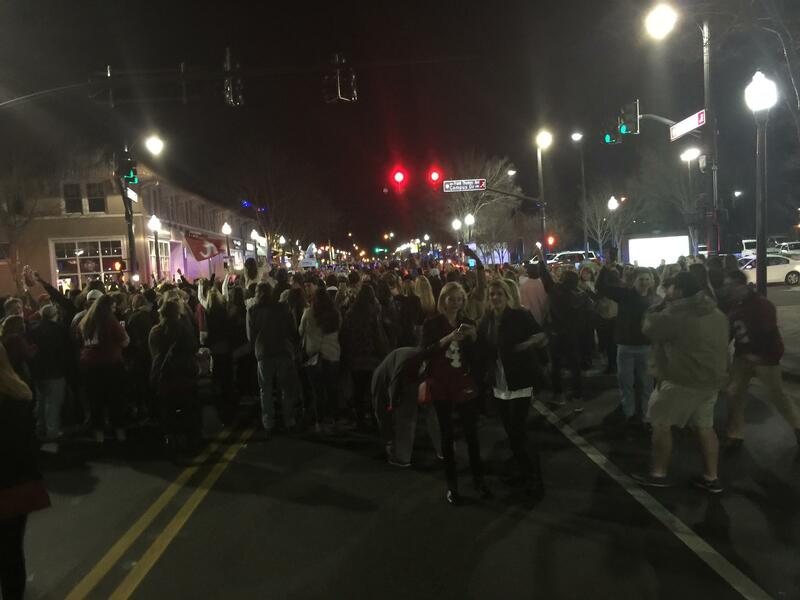 Alabama fans piled out on to University Boulevard right outside of the Tuscaloosa campus to cheer as the Crimson Tide won the program’s 16th National Championship. John Hadden just bought a National Championship T-Shirt at Bama Express on the strip. He says it’s exciting to see another championship come back to Alabama. The win gives Nick Saban his fourth national championship as the head coach of Alabama and his fifth overall. The Alabama Republican Party is asking Speaker of the House Mike Hubbard to step down ahead of next month’s legislative session. The party says they’re hoping to avoid distraction. Hubbard is facing nearly two dozen ethics charges accusing him of using his public office for personal gain. His trial is scheduled to begin March 28, in the middle of the upcoming legislative session. The Alabama Republican Party Steering Committee passed a resolution asking Hubbard to suspend his leadership position until after the trial. Party Chair Terry Lathan says lawmakers must be focused on the needs of the state, and Hubbard’s legal situation will make it very difficult for him to meet the demands of his role as Speaker. Hubbard calls the committee’s request “both premature and ill-advised” and does not plan to step down. He says the vote is due to lingering resentment over compromises made to fund the state government last year. Alabama’s 2016 legislative session is three weeks away, and state lawmakers are starting to make preparations. More than a dozen bills have been pre-filed for the upcoming session, including measures to restrict abortion, expand gun rights and protect Confederate monuments in the state. But State Representative Mac McCutcheon says lawmakers’ top priority for the upcoming legislative session is pretty clear. One potential new source of revenue is an increase in the state gasoline tax. The Joint Transportation Committee is holding a series of meetings across the state to gauge interest. The next meeting will be held a week from today in Montevallo. Alabama Public Radio's morning newscast for January 12, 2016.